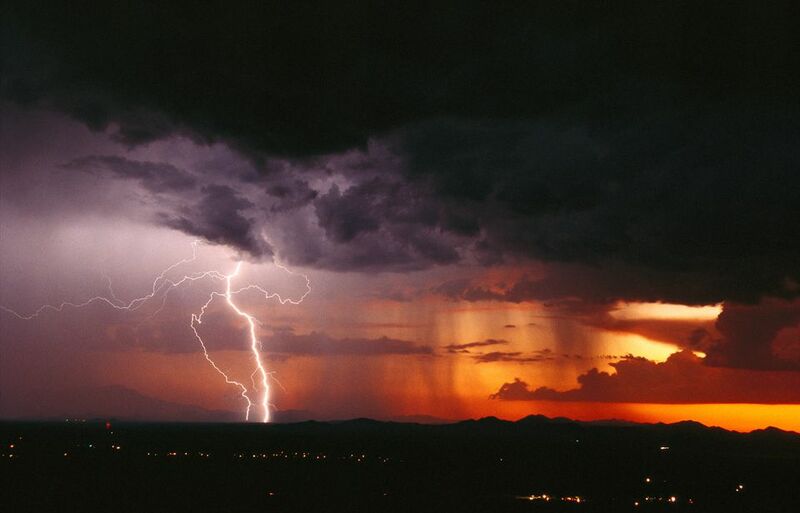 During the monsoon or summer thunderstorm season, Arizona experiences more severe weather than many other states. On some occasions, a severe storm may spawn a microburst, but more often high winds, dust, and severe downpours result in flash floods. Prior to 2008, the Phoenix area monsoon season was considered to start when there were three consecutive days that the dew point averaged 55 degrees or higher, but in 2008 the National Weather Service decided to take the guesswork out of monsoon start and end dates. After all, since monsoon season is a season, most people should not be concerned with whether or not a particular dust storm is defined as monsoon storm or not. Beginning in 2008, the National Weather Service established June 15 as the first day and September 30 as the last day of the state's monsoon season, allowing visitors and residents alike to be more concerned with monsoon safety and less concerned with technicalities of the season's start and end dates. Meteorologists in the state track and report dew points and study monsoon weather patterns in order to better prepare residents of Arizona or future monsoon seasons. The National Weather Service and the Arizona State Climate Office track this data in order to better understand how weather patterns affect the state's climate during the summer months. On average, the starting date for monsoon conditions in Phoenix is July 7 and the average ending date is September 13, but the official season starts and ends much later than the data supports—allowing for preparation for unexpected early and late-season monsoons. Historically, the earliest start date for the monsoon season was June 16, 1925, and the latest start date was July 25, 1987. Dewpoint conditions required for monsoon weather are recorded 56 times a season on average, but the greatest number of monsoon days in Arizona was 99 in 1984 and the lowest number of monsoon days was recorded in 1962 at just 27 days. The greatest number of consecutive monsoon days (with dewpoints above 55 degrees) was 72 from June 25 through September 4, 1984, which was also the greatest number of consecutive days with dewpoints of 60 degrees or higher. Although rain is a part of monsoon season in Arizona, high winds, dust storms, and even tornados can result from the high dewpoints recorded during the summer months. In Phoenix, normal rainfall during the height of monsoon season—in July, August, and September—is 2.65 inches, but the wettest season on record occurred in 1984 (it was a bad year) when the state received 9.38 inches of rain resulting in heavy flooding of many roads. On the other end of the spectrum, the driest monsoon season on record occurred in 1924 when Arizona only received .35 inches of rain, resulting in a drought and a subsequently high hazard for wildfires. Monsoon season can bring serious damage to the state as high winds can toss debris around, down trees, damage power lines, and destroy structures like roofs and shelters. Manufactured homes are especially susceptible to damage as they're typically not designed to withstand unusually high winds or other severe weather. In order to better prepare for monsoon season, it's important to review safety guidelines for being caught in galeforce winds. Just like you would in a tornado, bunkering down in a door frame or the bathtub away from windows is your safest bet if you can't get to a shelter before the storm. Hey Weather Guy or Gal: What Does Dew Point Mean?